Ninja-K comes face-to-face with the killer responsible for assassinating former MI6 ninja agents. The ensuing battle reveals some deep dark secrets about the history of the Ninja Programme that will rattle Colin. The opening fight sequence is beautifully choreographed by Tomas Giorello and Roberto De La Torre. Diego Rodriguez's colors tend to be darker with Colin's signature purple highlights contrasted with brighter backgrounds. Old school versus new school ninjas using their bests techniques and gadgets to try to get the upper hand but Ninja-C has old man strength. They wave the white flag long enough so C can explain himself about what motivated him to kill Ninja-B. There are occasional "exposition dumps" in comics that provide necessary context and information regarding the plotline for readers. They can sometimes be awkward when they go on long enough to feel like prose, jammed into a short arc, or the creators have abandoned showing and insist on telling their story. Welcome to the Mount Vesuvius of exposition dumps. It's basically Ninja-C's life story and it revolves around him growing up through the programme. And while the thought of an extensive backstory of a guest character dominating an issue might seem too much of a detour, Christos Gage makes it surprisingly compelling and irresistible. Through the revelation of the existence of MI6's Acclimation Bureau, Ninja-C's life was manipulated to always favor the programme eschewing all chances of a regular life. Just when they think they're out, the programme pulls them back in. The Bureau's invasive maneuvering leads to some tragically somber consequences for C, leaving him little to do but work for them destroying relationships along the way. They've basically controlled his whole existence using him for their own needs leaving him a shell of a human being despite giving the programme all he had to offer. There was no such thing as retirement. It motivated him to seek revenge for his stolen life. Gage draws some empathy for C despite his evil intentions. Colin must reconcile with what he's heard and the reality of one of his mentors being killed. Gage brings it all around in the end creating a riveting narrative out of a montage of flashbacks. 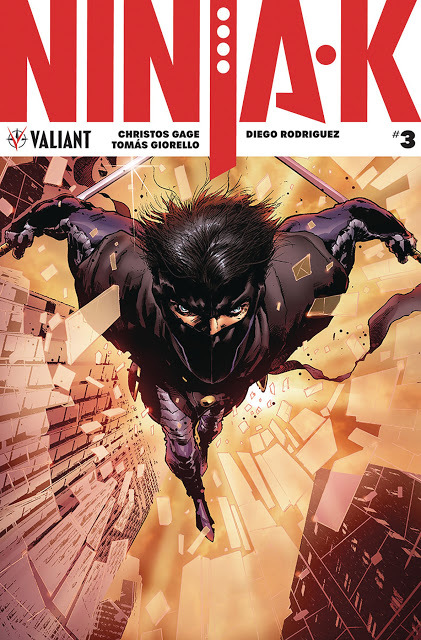 'Ninja-K' #3 is a meat-and-potatoes type of issue, feeding the reader with a hearty and necessary meal of information. It's all executed well with some action to appease fans who are used to the cinematic fireworks found in Valiant comics. Gage sets up a greater scheme with Colin's newfound knowledge and Giorello's art continues to shine.